Personnel - Stacy Dillard: tenor saxophone; Eric Reed: piano; Corcoran Holt: bass; McClenty Hunter: drums + guests Eddie Henderson: trumpet; Donald Harrison: alto saxophone; Dave Stryker: guitar; Christian Sands: piano, Rhodes; Eric Wheeler: bass. 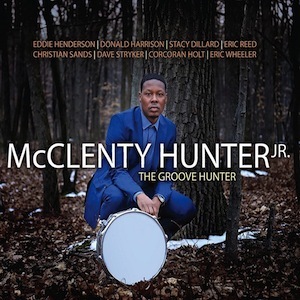 The drumming qualities of McClenty Hunter could be fully enjoyed throughout the years while performing with Kenny Garrett, Eric Reed, Jim Snidero and Dave Stryker. His faultless rhythmic drives have a special meaning now since he gathered some of the most revered heavyweights on the scene to play with him on The Groove Hunter, his debut full-length album. The guest appearances include emblematic musicians like trumpeter Eddie Henderson, altoist Donald Harrison, and guitarist Dave Stryker, but also emergent talents such as pianist Christian Sands and bassist Eric Wheeler on three tunes each. They expanded the possibilities of a tight core quartet composed of Stacy Dillard on tenor sax, Eric Reed on piano, Corcoran Holt on bass, and McClenty in the drummer’s chair. The album, pure post-bop thrill, comprises four gentle originals and a selection of five exciting covers. It kicks off with Herbie Nichols’ “Blue Chopsticks”, delivered in a classic piano trio format and exhibiting a push-forward attitude with fascinating rhythmic accents. After demonstrating his energy while trading fours with his bandmates, Hunter eases down his tempting rudiments so that Holt’s bass may speak. Wayne Shorter’s “The Big Push” is tremendous lush playing, having the first 16 bars defined exclusively by horns in parallel and drums. The Cookers’ members, Harrison and Henderson, contribute with their vitality as soloists, well seconded by Reed and Dillard before the reinstatement of the mesmerizing theme. Adrenalized by Harrison’s fiery blows, “Countdown”, a Coltrane classic, starts with dynamic drums and sticks to a rhythmic locomotion that only captures the original melody in the last half minute. The diversification also includes an interpretation of Stevie Wonder’s “That Girl”, packed as an elastic crossover jazz with improvisations by Sands and Stryker, as well as Gary McFarland’s “Sack Full Of Dreams”, a beautiful moment of brushed relaxation with the same couple of soloists opting for balmy, often bluesy melodies with deep feeling attached to their phrasings. I was struck by a joyous tranquility while listening to it. Pleasurable were also McClenty’s original compositions, predominantly explorative of the 3/4 meter along with a contemplation of melody that doesn’t cheat or disappoint. The one touching me the most was “My Love”, where the drummer, brushing elegantly, finds a poetic meaning in the combination of bowed bass and a delicate classical-imbued piano movement à-la Franz Liszt, before veering to a spiritual waltz with much to be admired. Dillard projects his tenor prayers in a soulful way, well followed by Reed, whose note choices and phrase constructions are riveting. Both are at the height of their improvisational prowess. The concluding piece, “Give Thanks”, exquisitely propelled by mallets for a deep-toned sound, also deserves a mention. The Hunter Groove is a notable jazz ride whose tightness and dynamism defines the rhythmic pathos of a gifted drummer who will certainly conquer much more in the future.